If I understand correctly, there is a Brexit alternative proposal that looks at a Norway +(?) model, and this implies the UK would still be a member of the common market through membership of the EEA. If anyone can offer some enlightenment, that's appreciated. Re: Softer / Common Market 2.0 / Norway style Brexit - Implications for EEA route? Any of the suggestions / proposals, if adoped by Parliament, would have to be negotiated with the EU first. Also, several of the proposals discussed recently mention "a" customs union, or "close alignment with" the single market, etc. ; rather than membership in "the" customs union or the single market. I think ultimately (IF they were to go in this direction), they might seek to negotiate an arrangement similar to EEA/EFTA/etc, but not necessarily membership of EEA/EFTA. Also, EEA/EFTA membership would have to be negotiated not only with the EU, but also with the EEA / EFTA countries (several of which have said No already). The outcome may be the same in practice, of course, as it's highly unlikely that they would get an EEA-style arrangement without free movement. It could be though that it wouldn't be called the EEA-route anymore, even if it worked largely the same. That's all just my interpretation of course. And all highly speculative at this point. Here is a summary of the Indicative Votes (IVs) being discussed today. It seems that the Norway Option is opposed mainly by Remainers, as it offers a relatively moderate alternative to a "Revoke and Remain". Given that it does include the freedom of movement, I am not convinced that it will get significant support in either Parliament or the country. It is worth remembering that Nick Boles, one of the main proponents of the Norway Option/Common Market 2.0, was deselected by his local Conservative Party Association. That shows the amount of hostility in the country (outside the cities and towns) towards a softer Brexit. Given that it has taken us two years to come to this stage, it is fairly obvious that the country is divided. Not only will the suggestions and proposals, approved in an indicative vote, have to be approved by the various stakeholders in the EEA (the various parts of the EU, the EFTA countries, etc), it will also need to be negotiated within the UK itself. It is also worth remembering that the Norway Option/Common Market 2.0 is only an option after leaving the EU i.e. after the Withdrawal Agreement (including the Irish backstop) takes effect. The issue at the moment is that Parliament can't seem to get past the WA, never mind getting into the nitty-gritties of the Political Declaraion regarding the future relationship (PD). It is also worth remembering that the European Parliament (EP) elections are due in May this year and the composition of that will dictate the election of a (possibly very different) European Commission. Here is a projection of seats from Politico. The two largest parties (EPP and S&D) are expected to lose their duopoly, though ALDE (led by Guy Verhofstadt and the EP party the Lib Dems are affiliated to) and the entry of La Republique En Marche (Macron's party) should make up for the loss of a majority of the two largest parties. But a lot more smaller, more Eurosceptic parties are expected to win seats (even if UKIP is not around). As an aside, if you are an EU citizen living in the UK, you may be able to register to vote in EP elections in your home country. Always register to vote and be sure to cast your ballot in all elections in which you have a stake in the outcome. So, don't hold your breath on the Norway Option/Common Market 2.0. 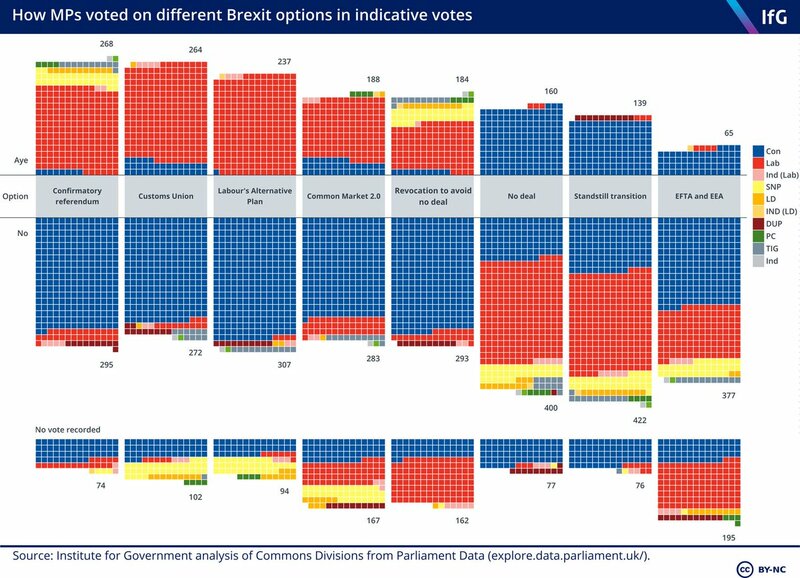 The Indicative Votes are in, and as I expected, the softer Brexit that appealed to MPs is one with a Customs Union/Customs arrangement with the EU. The EFTA/EEA option got significantly rejected (with the least number of votes in favour), though the Common Market 2.0 (essentially Single Market + Customs Union as I understand it) did do better that pure EFTA/EEA. Interestingly, the Joanna Cherry/SNP motion (to make Revoke the legal default rather than No-Deal) also failed, but got way more votes than generally expected. The online expectation was for that motion to get votes in double-digits. There will be a further round of Indicative Votes on Monday. While the specific motions for Monday will not be known until early that day, the expectation from a senior commentator is that there will be an indicative votes on the Deal and the Deal + either/both CU and/or 2nd referendum. Note that Monday's vote on the Deal will not be a Meaningful Vote as required by Section 13 of the EU Withdrawal Act 2018, which requires a Minister of the Crown to move the MV motion. The votes on Monday will be indicative votes on backbench motions. I believe the revoke Article 50 should do well in the future. Only way to end the humiliation that the UK is face. I would never had dreamt that brexit will bring the UK to it knees like it did.